I've definitely seen a female one of these in the Midland Township area. If I wasn't an arachnophobe, I would have been fascinated. Had a couple in my yard last year. They're pretty. Argiope is the most wonderful colored spider! Fairly common find in local willow trees. I tend to find 2 or 3 in a looking day. Adrian, MI. Haha I live in Lennon now, and I have only seen one, so they are still here. I saw one of these gals last Summer. I thought I even spotted a male on the web at one point too. But that could easily be some error on my part. If I see her (or at least another one) again this year. I can try to catch a 3D pick with my DS. Each snapshot takes two pictures. When you place them next to each other, you can get a stereoscopic 3D effect, even on regular computer screens. I had one in my back porch about 2 years ago. My hubby wouldnt walk through there to go outside until the spider finally went away in the fall. We're in Kalamazoo, MI. Okay, I found a spider that I didn't think lived in Michigan. I found a Spitting spider on my door handle, and I have been looking to see if they live here but I can't find an answer. Do they live in Michigan? If I did send a picture, it would have to be off google images because I let the spider go. Found some females at a river my son an I fish, thought at first it might be a relative ,or mixed species of the Florida banana spider. caught three an put them in a fish tank to observe, one made a egg sack the size of a large grape. prettty cool, waiting to show my older son when he gets Here. then letting them go. I've been catching those spiders for over 20 years in Hamilton, MI. I found one in my blackberry patch in St.Clare that was at least 3 inches in diameter. I thought it might be poisonous and it scared me to death! Now that i know they arn't I must admit they are very pretty. 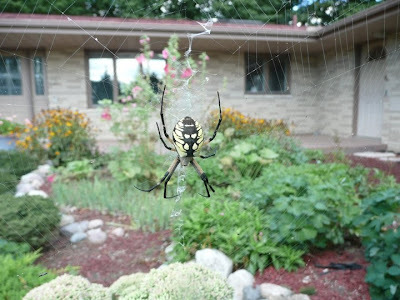 I think we have the banded argiope on our back porch in Byron Michigan (about 20 miles or so from Howell). She only brings her web out at night though to catch the bugs and brings it in before I get up in the morning. Scared the crap out of me last night until my mother told me she's been there for the last week or so... If I feel exceptionally brave tonight I will get a picture, but I have always had a thing with spiders that I don't bother them if they don't bother me. I have these often near Higgins Lake. One a couple years ago spent the entire summer in the corner of my sliding glass door, she was beautiful and only got to be about an inch. I also saw one several years ago that was approximately 3 inches. I seriously thought I was hallucinating, and ran into the house screaming. She was long gone before my husband came home, and he still swears I was making it up. We just two of these at Hudson Mills Metro park. there webs were in tall grass about 3-4 feet high aong a small creek. They were about 3 feet apart, both in the center of their webs. One was at least 3 inches in length, the other maybe two inches, very attractive looking. Hi, my name is Brad Milot. I live in Taylor, MI. I was cutting my grass when I discovered what I believe is known as Argiope Argentata better known as the Silver Argiope. It was rather large, about the size of a fifty cent piece. I captured it and showed my family, photographed it, and later released it. I later found out its a species not common to Michigan. I need to learn more about this spider if anyone has some input on it. Seen these spiders 30 years ago. They lived on the skirting of our trailer. I believe there were 3 or 4 along the side. I just remember that beautiful yellow color and those gorgeous webs. I have always wondered growing up what they were. Thanks, now I know. For the last three years i get one that sets up camp outside my back door between two plant holders. I have heard them called writig spiders as well due to the fact they make little z's and x's in the middle of thier web. They are beautiful spiders and will keep your bee and wasp population at a minimum. I read they love to eat those, and they are totally harmless. It was years ago, but I found a 1.5 to 2.5 inch Banded argiopes in Gallup Park Ann Arbor once, it was huge! Comparable to the 3.5-4 inch Fishing Spider and 2.5-3 inch Nursery Web Spiders I've seen scurry around. My mother had two of the yellow spiders living on her hosta plants and made amazing zipper type webs! Beautiful! I have one currently living in my garden, building a web near my ghost peppers - Walled Lake, MI. Found huge one on rose of Sharon building web. Light green matched the leaves on the plant. Had a female in her web on one of my yew shrubs in Ann Arbor. What a gorgeous girl! A male built his web just two feet away from hers. He was much smaller, but obviously in love! Now that we know what this is, we seen both a male and female in Ray Township around a pond. I thought it was the male that was so large but I guess its the female. Either way, they give me goosebumps! We live just north of Lansing, Michigan. On any given morning with a heavy dew it is easy to find countless argiope spider webs in the 5 acre field behind our house. They usually have a yellow/black spider sitting dead center in the web waiting for breakfast to arrive. I found one of these 2 years ago in my garden in Ecorse Mi. I was weeding, turned around and found this huge spider in a very large web and screamed. lol. Every couple days, she would move her home to a new location. I had hoped she would have babies to take up residence in my yard but I have not seen any more. I keep looking and hoping. They are supposedly attracted to roses and I have several different species. I am not a spider fan, but they eat aphids and other bugs. As long as they cannot harm me or my kitties and eat the bad bugs they can stay. Mine made a fabulous web on the deck rails. I loved going out every morning to check her out. She disappeared in fall. Rockwood, MI...35 years ago...when I was a kid, I called it my Banana Spider!!! can you keep a black and yellow argiope in some kind of tank in the house as a pet just wondering???????.....lelia. Here you are sharing helpful topics, keep such update and share best ideas over to all and me so I very happy with this. What Is Anti-Adware?